We learned from our guide that in ancient times, the mountain was full of caves inhabited by religious hermits. Legend states that Knight Parsifal discovered the Virgin of Montserrat… a miracle-working black virgin statue, found buried in a mountain cave, during the 12th century. The Virgin of Montserrat is a statue of the Virgin Mary and infant Christ. She is the Patron Saint of Catalonia – an honor she shares with Saint George. 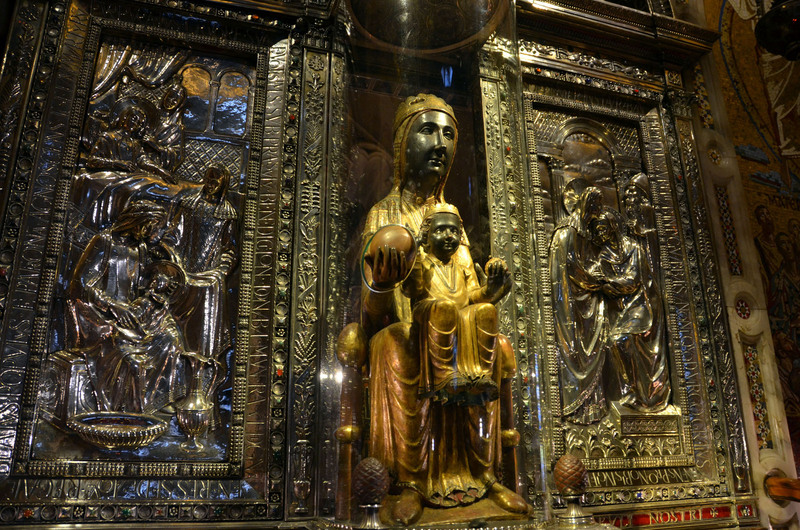 She is one of the Black Madonnas of Europe, hence its Catalan name, ‘La Moreneta’ (“the little dark-skinned one”). The statue, believed by some to have been carved in Jerusalem in the early days of the Church, is more likely a Romanesque sculpture in wood. The statue disappeared from historical record, only to reappear in a legend, of shepherds who found the lost statue under supernatural guidance in 890. The legend goes, that while tending their flocks, the shepherds were amazed to see lights and to hear singing coming from the mountain and from inside the cave. The shepherds then reported the situation to their priest, who investigated. When the priest also heard the singing and saw the mysterious lights, he informed the Bishop – and he also witnessed the phenomenon. Because the statue was thought of as a miracle, it was brought out of the cave and placed in a small church that was soon erected. As to the reason why the Virgin Madonna is black, author Stephen Benko notes: “It is well known that the symbol of the Greek goddess Isis and her son Horus was basically adopted by the Christians, when they started to portray Mary and Jesus as Mother and Child. Isis was sometimes pictured as black. Perhaps this lost statue of Isis was located by ninth-century shepherds and assumed to be the Madonna and Child, in spite of the dark features. The sculptor, of the statue, might have been inspired by the commentaries of the Song of Songs (“I am black but beautiful”), which were popular at that time.” Or perhaps, author Joan Carroll Cruz is closer to the simple truth that: “the dark color of the Virgin of Montserrat is attributed to the innumerable candles and lamps that have burned day and night before the statue – for centuries.” Regardless of the enigma of the statue’s color, it has always been considered one of the most celebrated images in Spain. The Black Madonna has received innumerable pilgrims, currently at the rate of at least one million per year. This has included secular and ecclesiastical rulers as well as a number of canonized Saints. The most notable of these pilgrims was St. Ignatius of Loyola, who laid down his sword and embarked on his religious mission, after spending a night praying before the statue – a miracle in the order of grace. After visiting the Virgin of Montserrat, we were ushered into the awe-inspiring Santa María de Montserrat, a gold-encrusted Basilica, to listen to the moving performance of the Escolania de Montserrat – one of Europe’s oldest and most famous children’s choir. There was such a large crowd, that we all had to stand pushed up against each other – but because the choir and organ were so transcendent, no one cared. It was getting late and our bus driver did not want to take the trip down the mountain in the dark (and neither did we), so, unfortunately we missed the museum inside the Basilica. The museum houses works of art by many prominent painters and sculptors, including El Greco, Dalí, and Picasso. The Basilica also runs a publishing house, The Publicacions de l’Abadia de Montserrat, one of the oldest presses in the world, with its first book published in 1499. As we were winding down the road during sunset, I stared out the window into the clouds – and a Tennessee Williams’ quote came to mind: Sometimes there’s God so quickly. I love your blog. I’m envious but I will be calling you when I’m ready to travel.